of deep rounded form with a slightly flared rim, finely chased around the sides with a continuous frieze of hunters at the gallop, one with a club extended and ready to strike, the other followed by two hounds, shown with bow drawn, the target of his arrow obscured by bright green surface corrosion, all below a thin raised fillet and a border of foliate scroll, the decoration finely incised on ring-punched grounds, the rounded base engraved with very sparse landscape motifs of grass and undulating terrain, resting on a plain disc-shaped shallow platform raised on a knopped stem supported on a flared circular foot decorated with petal motifs on a ring-punched ground within a raised band encircling the footrim, the gilded surface with bright green corrosion and burial earth encrusted on the interior and with rust brown and bright green patination on the exterior. Compare the gilt-bronze stemcup of this form engraved with similar hunting scene in the Royal Ontario Museum, Toronto, illustrated in Chinese Art in the Royal Ontario Museum, Toronto, 1972, p. 221, no. 139. 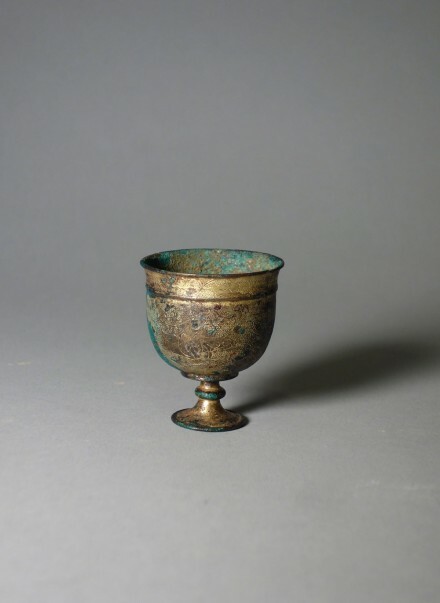 Compare also the silver stemcup with similar design, excavated in 1970 from a treasure hoard at Hejiacun in the southern suburbs of Xi’an, Shaanxi province, illustrated in Wenwu, 1972, No. 1, p. 39, no. 19. The same stemcup is illustrated again in Zhongguo Meishu Quanji, (The Great Treasure of Chinese Fine Arts), Vol. 10: Gongyi Meishu Bian (Works of Art and Craft), Beijing, 1987, p. 23, no. 49, with full description on p. 14.